To me, the Gundam franchise is like a bit like a well-loved pair of shoes. It’s nice and comfortable, but a little worn out. OK, maybe that’s a bit nasty I suppose, but most Gundam series are just a variation on previous series (“G Gundam” being the obvious exception). 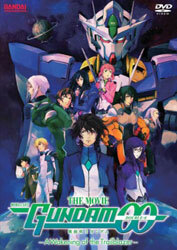 “Gundam 00” on the surface seems to have borrowed slightly from the core concept of “Gundam Wing”; a group of bishonnen fighting against armies in their personalised Gundams, though in this show they operate as a team and not individually. 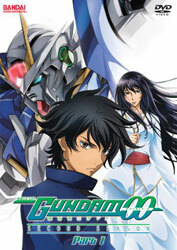 The four main pilots in the show have personalities similar to those in “Gundam Wing”, especially the protagonist of the show, Setsuna F Seiei , who is very much like Heero, the lead in “Gundam Wing”. The show is set in 2307, where the world has depleted all of its fossil fuels and now uses a huge array of solar power collectors in orbit around the Earth, supported by three orbital elevators. Three “power blocs” each containing a group of countries, support each elevator and naturally this led to military confrontations. In fact a 20 year “Solar War” has just ended. A private military organization called Celestial Being emerges out of this chaos and makes an audacious statement to the world that will eradicate all conflict on earth. To achieve this goal the organisation has four robots, called Gundams, at their disposal to quell any outbreak of war. The Gundams are highly superior pieces of machinery to anything in Earth’s military forces. However the three power blocs don’t take this lying down and join forces in an attempt to stop Celestial Being’s Gundams. OK, the main problem I have with this series is that the bulk story takes place on six main fronts; Celestial Being, the three separate power blocs, journalist Kinue Crossroad and her colleagues, and her brother Saji Crossroad and his overbearing girlfriend Louise Halevy. Then you also have a ton of secondary characters. While a large cast is par for the course in the Gundam universe, the links between these six sets of characters doesn’t actually become really tied to each other mid-way point for most of them. The odd one out is defiantly the links between everyone else and Saji Crossroad and Louise Halevy. They just seem to exist in this world and besides Saji’s sister being reporter and Setsuna living next door to Saji, there are links or seemingly any meaning as to why we’re following them. Yes, they do play a larger role in the second season, but it didn’t make sense to introduce them so early. Their presence adds nothing to the story being told in the first three quarters or more of the series. The addition of Haros also didn’t really add much. At least in “Seed” and “Age” they seem to be there for a purpose. With the large cast of characters, I found it rather difficult to figure out who I should concentrating on and what was important to the plot. But the plot itself was also a problem. First some of the main idea such as an organisation who wants to stamp out war and mapped out by a man who died 200 years ago is pretty absurd. The supposed age of some of the concepts and propulsion systems is pretty highly unlikely too. Besides a lot of the names being rather silly (not as bad as some of Tomino’s names from the original Gundam), you also some really cringe worthy dialogue and characters, mostly the Gundam pilots, looking pained up and serious while saying it. The best thing about the series is obviously the animation and the designs. The battle sequences are gorgeously detailed and have a very high frame rate. It’s obvious that Sunrise has poured a lot of time, effort and money into this project. Overall and on balance, the show is a really good piece of entertainment. If the focus had been much clearer and precise, I would have enjoyed it much more. 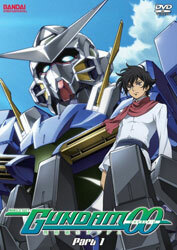 In fact I’m enjoying “Gundam Age” (currently streaming on Gundam.info) more than this show mainly because of that fact. 6.5 out of 10. The second season takes place four years after the events of the final episode. Due to Celestial Being’s intervention in various conflicts across the world, the three “Power Blocs” united together and virtually all wars ceased. A new force is created called A-Laws whose main job is to crush all opposition to the new united government. In particular a rebel group called Katharon has emerged and are determined to expose A-Laws and its brutal crackdown on any dissent. Celestial Being reforms also to fight against A-Laws. However behind the scenes is a shadowy group called the Innovators, which is a small unit formed of people who have special abilities. The Innovators have been manipulating the Earth governments and A-Laws as part of their master plan. While it seems that the creators of this series hit the reset button (to a degree), the show does build upon what happened in the first season. The first few episodes contain many scenes of our favourite bishonen look concerned and make profound statements, but soon it develops into really good thriller, albeit with fighting robots. I did find the conclusion a bit too much. Three episodes which portrayed one very, very long battle did my head in. After the screwing around with Saji Crossroad and Louise Halevy, their roles and story become very well defined in this series. I really thought the series planners could have written their parts a lot better for the first season. The main plot with the Innovators was really intriguing, but it is never made clear if they are genetically modified or a new species of humans. The Innovators group themselves have terrible uniforms which look like they came from a bad 1970’s sci-fi film like “Logan’s Run” or something. Certainly there’s a bit of stupidity in this show; Gundam pilot Tieria Erde (who’s male) infiltrates a party for a number of high ranking officials, dressed as a woman. He even has a prefect female figure. Was this sequence meant to be serious or is it some sort of unfunny joke? There’s also the replacement for Lockon Stratos which defies belief. In the end I did enjoy this show a lot more than the first series. It still has a number of problems. I think for the most part the staff crammed too many ideas into the show and didn’t develop a lot of the m properly. For example it is never really explained how Marina Ismail’s (the princess of Azadistan) song infiltrated its way into the consciousness of the general population despite the fact her and the children she was looking after seemingly never made contact with the outside world. Magic, was it? 6.5 out of 10. This film follows on from the second season, the bulk of the story taking place a couple of years after the events of the final TV episode. The plot here is quite different to any Gundam series so far. It involves the return of an exploratory space craft making a return to Earth from Jupiter. The space craft is headed on a collision course to Earth and Earth forces do their best to try and break up the craft. Unfortunately some pieces end up not burning up in the atmosphere and make it to the surface of the Earth. Within the debris zone, strange occurrences begin to happen. Accidents involving Innovators happen regularly. Some Innovators are attacked by what seems to be a living metal. It is concluded the metal is an alien life form and is dubbed Extra-terrestrial Living-metal Shape-shifters (ELS). It is soon discovered that a large metal sphere and an uncountable number of smaller alien creatures are materialising out of the great red spot on Jupiter on a course headed for Earth. All of the Earth forces including Celestial Being join forces to fight off the alien attack. Judging for the codas on both season of the TV series, Sunrise had the entire structure and plot worked out of the entire franchise, from episode one to the movie, beforehand. One can only wonder why it’s so damn incomprehensible for a fair wack of its length. Some trimming of storylines and the deletion of swathes of characters would have helped immensely in terms of storytelling. Too many characters, too many ideas spoil the series. The film gets bogged down right from the start, and then ends up like an animated “Maximum Overdrive” (yes, the crappy Stephen King film) with tons of driverless vehicles chasing our heroes. Then it sort of starts to borrow a bit from “Bye-Bye Jupiter” and some bits from “Gunbuster” and with some original material it sort of develops into a rather intriguing movie. Then we have a rather draining hour long battle sequence, and one hell of a schmaltzy and moralistic (can’t we all just get along?) ending with a very silly and perhaps embarrassingly sappy coda. There’s also a couple of characters I’d never seen before who are presented matter of factly, as if there were normal cast characters. It had me scratching my head. Maybe it was the ridiculously large cast of this show which did my head in and I could remember who was new or I’d seen before. Anyway, it’s a decent movie ruined by a stupid ending and homage’s to bad 1980’s films directed by Steven King. 6 out of 10, and I’m being rather generous.